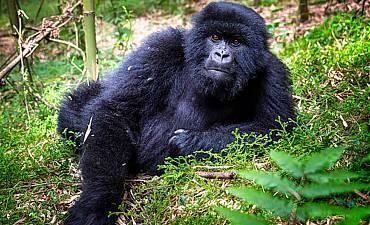 Are You Planning A Primate - Gorilla Safari To Rwanda? Scroll Down..
Primatologist Dian Fossey began her research into the mountain gorillas in Central Africa in 1967, and her work brought to light the plight of this gentle and elegant endangered species. 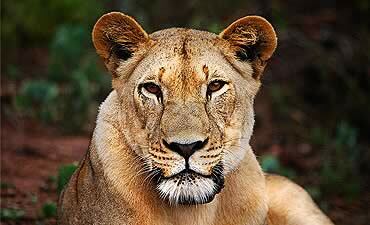 Her legacy continues as these extraordinary primates touch the hearts and minds of people around the world. AfricanMecca Safaris is proud to offer its guests in Rwanda the opportunity to see the mountain gorillas of Volcanoes National Park and other primates like chimpanzees in their natural habitats such as in Nyungwe, a life-changing adventure-travel experience that will forever be etched in your memory. The gorillas are the last remaining big apes in Africa, and their numbers are very small; poaching, trophy hunting, and habitat destruction have left around 880 of these enchanting animals in the wild. With so few left on the planet, each loss of a gorilla takes this precious species one step closer to extinction. Conservation activities in recent years, including aggressive anti-poaching efforts and close monitoring, have resulted in a slow increase in the number of wild mountain gorillas. Even the primate treks, designed to promote understanding and protection for the species, are provided to the public under extremely strict protocols that are consistently enforced without wavering. Yet, much work remains to be done before the world can feel at ease about the future of these primates. As some of the world’s most cherished mammals, mountain gorillas are now able to roam their natural habitats relatively undisturbed. 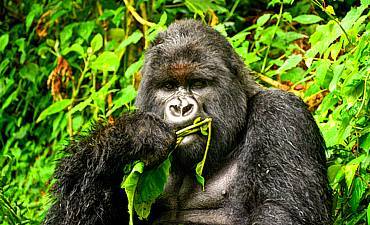 With limited space to forage and thrive, the gorillas have found solitude in protected areas of Rwanda, Uganda, and the Democratic Republic of Congo. Rangers work tirelessly as sentinels, always on watch and looking for anyone with intent to harm or capture a gorilla. The high level of protection that surrounds these African primates means that relatively few people get to see these animals in the wild. Those who do, though, understand that the experience is much more than a casual safari activity—it is, indeed, a rare privilege. Senses heighten as your guide indicates that your group is close to a family of magnificent, isolated mountain gorillas. The slightest rustle of leaves focuses your attention on the dense foliage just ahead. Following your guide’s careful instructions, you quietly step forward and kneel down. Deep green vegetation frames a surreal and utterly captivating scene: a massive silverback male sits quietly while keeping watch over his gorilla family. He appears to be somewhat disengaged, but your intuition tells you that he is quietly vigilant. Close to the dominant giant are two females and several juveniles engaged in grooming and nibbling on succulent bamboo shoots. Just inches above them is a tiny infant, struggling to keep hold of a branch. You smile deeply at his awkward agility and determination. You sit in awe of the gorillas for the next 60 minutes, capturing every possible moment with your camera. The human-like behaviors and intimate relationships among the primates earn them a permanent place in your heart and mind. When your guide signals that it is time to leave the gorillas behind, you feel as though you are leaving behind members of your own family. For our guests, mountain gorilla treks are both educational and bittersweet--but always the ultimate holiday experience in the mountain forests parks of Rwanda. 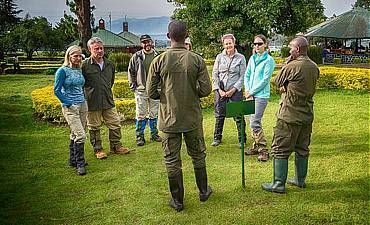 To ensure a superior experience with the mountain gorillas of Rwanda, guests are required to follow clearly defined protocols. Guests must be at least 15 years old and in excellent physical health. The health requirement is not only to meet the demands of the trek, but also to protect the gorillas from contracting flu, colds, or other infectious diseases that can be passed from humans to primates. When in the presence of the gorillas, your guide will require you to stay at least seven meters (22 feet) from the family. This requirement ensures that the gorillas do not feel threatened and that any diseases they may carry are not passed to guests. The Rwandan Development Board, which is responsible for managing the protection of the mountain gorillas, has a set limit of 80 permits per day for guests who wish to participate in treks to see the primates. 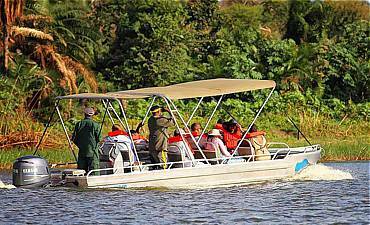 We recommend that you plan well ahead, as this is the most popular activity among visitors to Rwanda and the permits go very quickly. 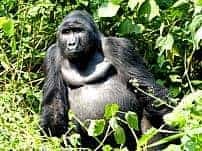 If you want to include mountain gorilla trekking in your nature tour, your AfricanMecca tour planner will arrange for the permit, the cost of which is included in your personal African safari package. During your gorilla tour in Volcanoes National Park, we recommend that you wear long trousers, a long-sleeved shirt, waterproof jacket, and heavy-duty boots designed for traversing muddy, steep, and rugged terrain. You should also bring heavy gloves and a walking stick. Those who wish to hire a porter to help with camera equipment and offer a hand when you need extra support on the trails will want to bring some cash, as well. On the day of your trek, you will be assigned to a group of people who are of similar fitness levels and ages. Guests who are 45 or older are typically placed in a group that stays near the base of the mountains, while younger, more athletic guests are assigned to groups that take the more challenging hikes to higher elevations. Your group is assigned to one of the 10 gorilla families. If you are familiar with the mountain gorilla families in Volcanoes National Park, you can request a group that is planned for that particular family of primates. Before you begin your journey to see the gorillas, you are briefed on proper trekking and mountain gorilla etiquette to maximize your enjoyment of the experience. You should expect to return to base by early evening. While the mountain gorillas in Rwanda provide our guests with a serene experience in the bush, many guests also desire a high-paced primate activity to round out their adventure vacation. Luckily, Rwanda is home to several smaller species that will entertain you with their antics and constant movement in the trees, including the rare and endangered golden monkeys, a subspecies of the more common Sykes’ or blue monkeys. These primates roam freely in the higher elevations and their most striking feature is their dark golden-orange eyes, framed by short, soft grey fur, a black stripe down the nose, and white-grey whiskers around the mouth. The primates’ spectacular coloring continues with longer fur on the face that is speckled orange and black, and a tuft of black fur on top of the head. The nape of the neck, arms, and legs are covered in black fur, while the back is covered in a golden-orange fur that matches the eyes and extends down most of the tail, except for a black tip. Golden monkeys have personalities that are just as colorful as their costumes. They spend most of their time scampering through the branches of the forest canopy, only occasionally stopping to nibble on something tender or simply gaze down at those observing them from the ground. 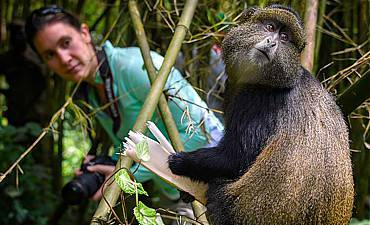 Golden-monkey trekking in Volcanoes Park is easier to integrate into your bush trip because the Rwandan government has not set limits on the number of guests each day. The monkeys are rare and endangered, though, so we encourage you to follow similar precautions as required for mountain gorilla trekking. Guests are divided into groups of eight or fewer and each group is assigned to one of the habituated golden monkey troops. Each troop has between 80 and 100 members, and the first troop is typically located at the base of Mount Sabyinyo. Photographers should expect to exercise patience with golden monkeys, as the dense foliage and their rapid movements make photographing them difficult; only rarely will you have the opportunity to photograph a golden monkey on the floor of the forest.Rwanda is also home to numerous other primates that you will see during your activities, but planning treks specifically for mountain gorillas and golden monkeys allows you the best chance to see these two rare and endangered species. Some of our guests are interested in seeing chimpanzees in the African wild especially in the famed Mahale Mountains National Park & Gombe Stream National Park in western Tanzania because these primates are the most human-like, sharing 96% of our DNA. Most guests are able to recognize chimpanzees, but few understand how their facial and body features affect their behaviors. Chimps have flat faces with small noses, so this indicates that they rely little on smell. Their forward-facing eyes, though, demonstrate that eyesight is an important sense that helps them see bi-focally with good color and depth perception, much like humans. Male chimpanzees are slightly taller than females, standing at about four feet, with females being around three feet. Observing their behaviors in a natural habitat is an engaging adventure-travel experience that is sure to be a highlight of your vacation time in Rwanda. You may even witness behaviors that are testament to their high intelligence, such as using sticks as tools for foraging. While adult chimpanzees tend to be more relaxed in their demeanor, infants are much more active and even a bit mischievous, often making attempts to gain the attention of the adults and frolicking with other young chimps. Watching the social dynamics of a group is both educational and entertaining. The forests of Nyungwe National Park offers the best place to track down chimpanzees in Rwanda, but, as is true of any wild animal, there is no guarantee you will find them even with the best tracker and guide. These primates habitually move through the forest to find fruit and other food, only stopping for grooming and toward the end of the day to prepare their nests. Choosing strategic times to visit, our chimp guides give you the best possible chance of seeing a group of chimpanzees during your trip to this part of Central-East Africa. Treks in Nyungwe begin early in the morning, after dawn, and can be somewhat strenuous. The reward is worth the effort for most of our guests, as they often are able to spend about one hour observing this DNA synonymous creature. With 14 primate species found in Rwanda, mountain gorillas, golden monkeys, and chimpanzees represent only a few of the amazing animals that can be observed during an African primate safari. Most of the primates in Nyungwe are endemic, and many are endangered. Additionally, the park is renowned among primatologists, nature lovers, and adventurers alike for having one of the highest population densities of primates in a single location, as well as the greatest diversity of primates in East Africa. In fact, Nyungwe National Park is the only location in Africa where you will see what is known as “super groups” of Angolan Colobus monkeys, which have more than 300 individual monkeys. These animals are deep black with white markings. The primate species in the park vary in appearance and behavior; you will encounter some that are quite inquisitive, others that are shy and elusive, while still others only come out of hiding at night. Vervet monkeys are the most common in the park and also represent the most abundant primate species in the world. When you want to spot a vervet monkey, look for a primate with a grey body and black face mask near the guest house in Nyungwe Forest. 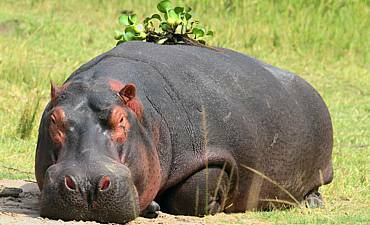 If you are in Akagera National Park, you can locate them in the open woodlands and savannah areas. 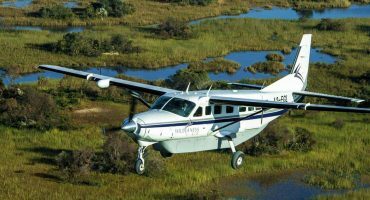 Finding these common primates takes less strenuous effort than a chimpanzee trek, so we recommend it for guests who desire a more leisurely primate tour as part of their exploration of African wildlife. L’Hoest’s monkeys, endemic to the Albertine Rift, are found in Nyungwe Forest as well as Gishwati Forest. You can identify them by their black bodies and distinct white beards. As you observe a group of these monkeys, note that most in the group are female, with only one male. These primates forage on the ground, moving on all fours. At the Uwinka Visitors Centre, look up into the tree canopy to find primates with a light grey and olive coat that appears bluish from a distance. These are blue monkeys, which live in groups of 10 to 40 individuals that are mostly females, with one adult male. Blue monkeys rarely come down from their elevated positions, so photographing them can be challenging; the best composition is a blue monkey framed by foliage. Mingling with the blue monkeys may be some Dent’s mona monkeys, which also live amid grey-cheeked mangabeys and larger groups of Rwenzori colobus monkeys. The Dent’s monas are small compared to other monkeys, with a brown body, long black tail, and white rump. Watch these delightful creatures as they forage for fruit, insects, and leaves, carrying their bounty in cheek pouches. The monkey with the most unique appearance, though, is the owl-faced monkey. Seeing these shy animals during your trekking holiday will a delightful part of your time in Rwanda. As you traverse the trails, look for their unique beak-like nose coupled with grey and white coloring, which gives these primates an owl-like face. Owl-face monkey groups are small, so you will have to rely on the keen eye of your guide. Rounding out the offerings of African primates in Nyungwe National Park are olive baboons, which are only slightly smaller than chimpanzees. If you come upon a group of baboons during your hikes or treks, be sure to listen to the instructions of your guide, as these animals are known to be aggressive. Olive baboons have canine-like snouts and are so named for their coloring. Even if you do not approach the primates, they may come toward you. Although trekking activities for your safari vacation are not available after sunset, you may come across pottos and bushbabies during an early morning or evening nature walk or game drive in Rwanda. One word describes these tiny primates: adorable. Pottos are greyish in color, and their exquisitely shaped hands and feet allow them to grasp branches. The most notable feature of bushbabies is their large eyes, which allow them to locate food in the dark. Their fuzzy fur ranges from silvery to dark brown, while their hind legs are strong to allow them to grasp branches while hunting insects and small birds and foraging for nuts, tree gums, seeds, fruits, and flowers. 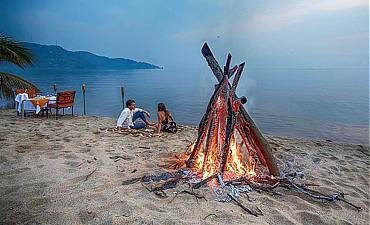 Rwanda is a specialty safari destination coupled with mountains, plains and lakeside viewing fauna. 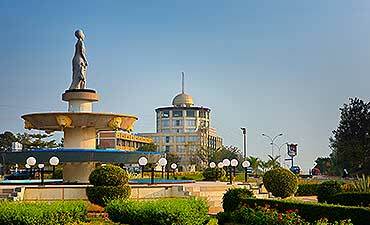 Your hilly adventure is heightened thanks to its gorgeous scenery, flora and pleasant climate. The playful antics and heartwarming social behaviors of mountain gorillas capture people's minds. AfricanMecca is proud to offer an insightful and enchanting trip into Rwanda's primate habitats. 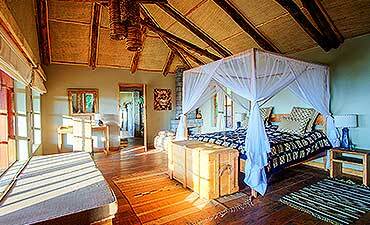 Flexibility is important during your wilderness trip to Rwanda so as to ensure an intimate, personal experience. 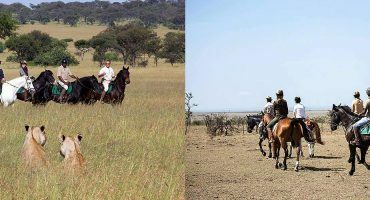 A tailor-made tour can be arranged for any guest regardless of their preferred safari tier. 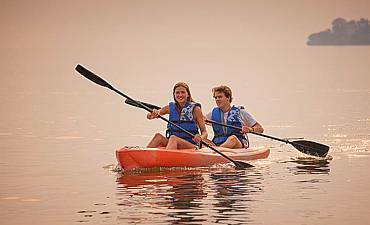 A honeymoon is a special time in the lives of newlyweds. There is no more memorable place to mark new beginnings than the pristine wilderness of Rwanda, with its magnificent and truly unique denizens. Rwanda is the perfect active-adventure destination to unleash your child's imagination, especially for 15+ year teens old enough to participate in gorilla-primate treks and other unique wildlife safaris. 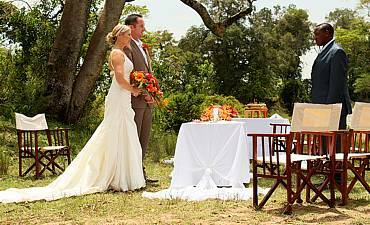 We understand your requirements when you talk about fulfilling your dream of the ultimate luxury vacation experience in Rwanda where your every bespoke and plush needs are carefully catered to. 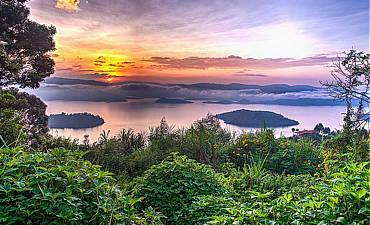 AfricanMecca hand-selects the Rwanda photography instructors we provides to our guests. 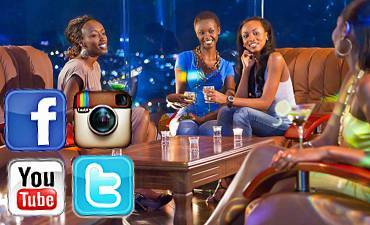 These are private photographers and exclusive encounters, and are never offered as part of a group. Rwanda is home to three tribal groups. 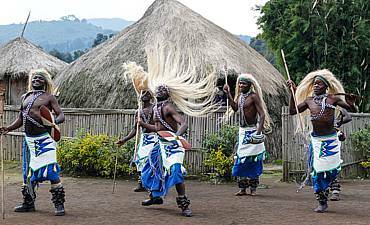 We highly recommend setting aside some time during your wilderness safari adventure to visit cultural communities and experience Rwanda's traditional way of life. 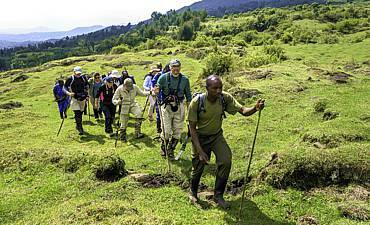 Rwanda is a hiking and trekking paradise, offering amazing trails for every experience level. AfricanMecca arranges hikes and treks in the top-notch protected areas of Volcanoes and Nyungwe Parks. 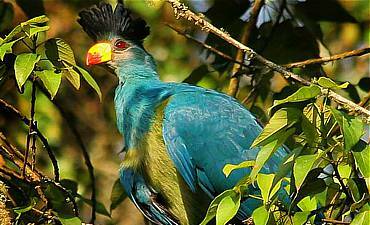 Rwanda is home to some of the most beautiful avian fauna in the world. Despite its relatively small size, the country boasts more than 650 bird species, offering our guests a superb birding safari. 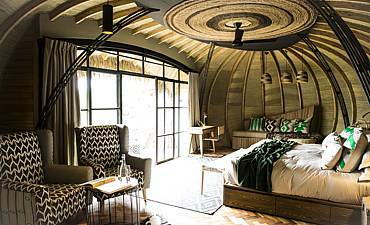 Rwanda promises an inimitable escape that few venture to. 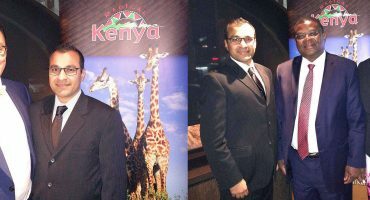 It appeals to brides and grooms who want the most extraordinary nuptial celebrations with all the romance of an exotic and unique safari setting.